It’s been a couple of years since I talked about universal remote control devices and apps. 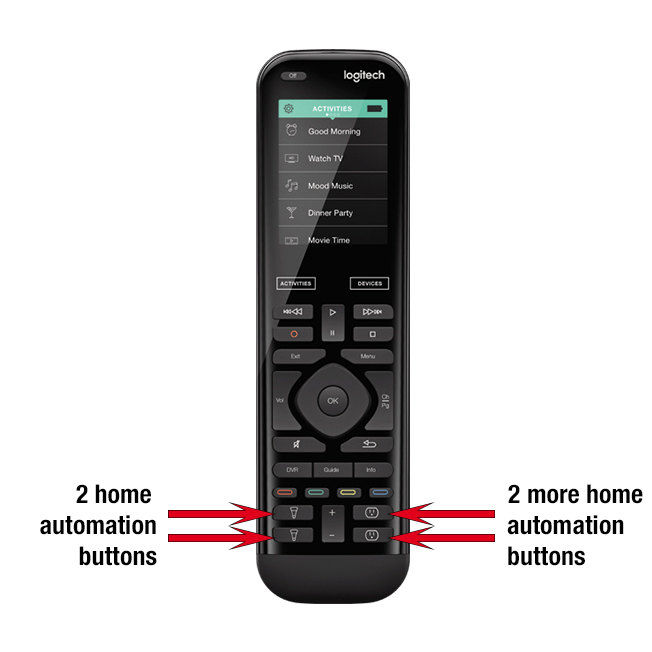 For me, an awesome universal remote control is the holy grail of home automation; having a single device that can mimic every function of all five individual remote controls for my home theatre system is priceless. And the ability to control my Phillips Hue and Lutron Caseta lights, Nest thermostat, and other smart devices from a single remote (or a single iOS app) is the icing on the cake. It’s easy to set up, can control all of my audio and video components (and roughly 270,000 other home entertainment devices). It’s more reliable than other app/hardware combination I’ve tried. It was (and still is) the first system I tested that allowed me to toss all of my old remotes in a drawer and completely forget about them. One of the things I like best about the Harmony products is that the Harmony Hub ($99.99) works with the Harmony iOS app, or with your choice of three physical Harmony remotes priced from $199.99–$349.99. All three offer an array of physical buttons, and the Ultimate One and Elite models also include a color touchscreen. I recently upgraded my Harmony setup by moving my (then) current Ultimate One system from the den to the bedroom and acquiring the latest and greatest Harmony remote, a Harmony Elite, for the den. At $349.99, the Elite is relatively expensive but in addition to the full-featured touchscreen remote itself, you also get a Harmony Hub ($99.99) and a pair of infrared Harmony Mini Blasters ($10 each; for components behind opaque doors or stored in closets). Around the same time I had the opportunity to test a new app-enabled universal remote system called Blumoo ($99.99), which is an infrared device you place near your components and control with the Blumoo iOS (or Android) app. The biggest difference between it and the Harmony system is that Blumoo offers no physical remotes—it is designed to work only with its iOS or Android app. The other big difference is that while support for Hue lights and other home automation gear has been promised for Blumoo in the future, the current model has no home automation support whatsoever. 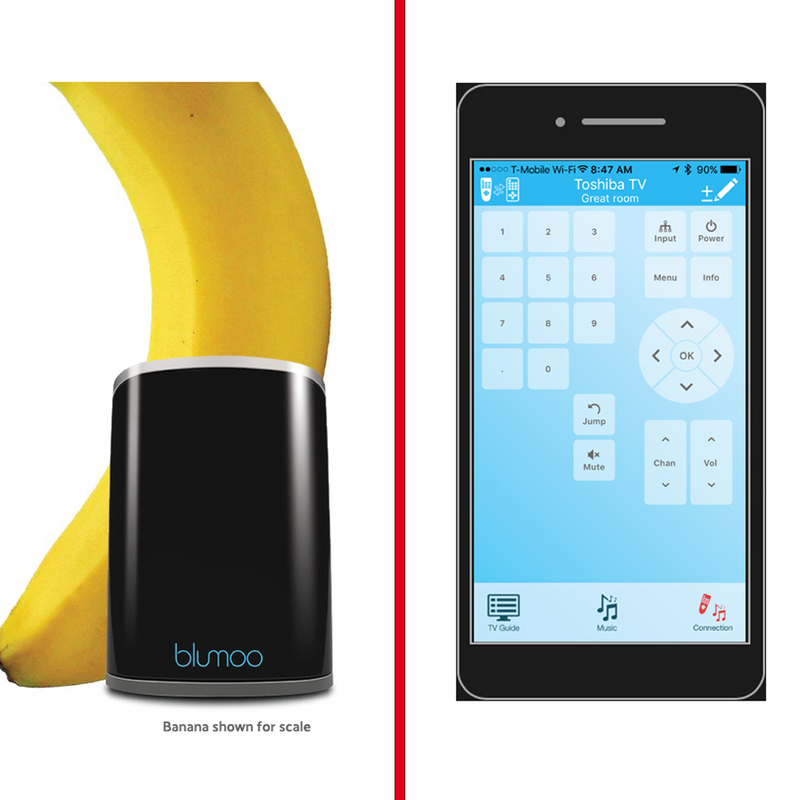 The Blumoo infrared device (left) and iOS app (right). Another thing that bugged me was that Blumoo’s initial setup was more tedious and time-consuming than the Harmony’s. Along the way I did discover one unique feature: You can also use Blumoo to convert any stereo system into a wireless speaker using the included RCA cable. Even so, in the end, the deciding factors for me were Harmony’s home automation support and the Harmony Elite’s four dedicated buttons for controlling lights and other home automation devices. The Harmony Elite has a color touchscreen and dedicated buttons for everything including home automation. While controlling everything from your iPhone or iPad can be convenient, having the option to also use a single remote control device with physical buttons is even better. While I’m a Harmony fan and would opt for a Harmony Hub for my $99, if you don’t think you’ll ever want a physical remote with buttons or care about home automation, the Blumoo may be just what the doctor ordered.